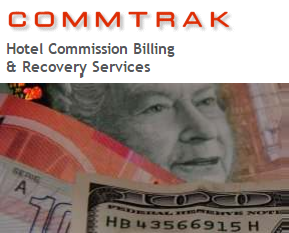 Since 1987, Commtrak has delivered supplemental hotel billing and commission recovery services to travel firms in North America, focusing on commissions more than 180 days past due. Commtrak customers currently include many of the most respected agencies and distribution firms, and nearly all of the 15 largest in the current Travel Weekly Power List. Commtrak delivers a product that applies significant benefits to agencies of every size and description. Our current customer base also includes a majority of the top 250 travel firms in North America. The company accomplishes its mission exclusively as a service bureau, and does not market or sell its core technology. The Commtrak fee is 50% of commissions recovered.